Is Big Economic Trouble Still Ahead? If you pay any attention to the financial prognosticators and the economic sites, you’ve inevitably heard the talk about the possibility of a “double-dip recession.” The theory has a number of variants, one of which is that the minute consumer demand begins to rebound, all the money pumped into the economy by the fed will chase too few available goods and massive inflation will come along to choke off the recovery. Stagflation would then be the result, and the economic recovery the country desperately needs will be longer in coming than anyone ever expected. Not exactly. First of all, inflation isn’t a major problem. It’s currently sitting at 2.6 percent, which isn’t a particularly problematic number. And despite all the bailouts and wads of government stimulus cash injected into the economy we’re not seeing a great deal of pent-up consumer demand being released, as was expected when stimulus dollars were spent. Call it a consumer confidence issue if you want, call it a public who for the most part perceives that we have enough cars and big-screen TV’s and would rather spend our excess income getting out of debt or call it far too many people unemployed or underemployed to spend any money. Call it whatever you want, but inflation isn’t choking off economic growth at this point – largely because there isn’t any growth to choke off. And the Daily Growth Index, which had tanked in the second half of 2008, managed to bottom out and begin recovering last year – and particularly during the summer and early fall as a result of cash-for-clunkers and the new home buyer tax credit (which apparently James O’Keefe will be exposing as rife with waste and fraud soon). As you can see from the graph at left, the transactions the Consumer Metrics Institute has tabulated into the DGI have generally tracked quite well against the official quarterly GDP figures. But the DGI has gone down the tubes of late. Growth has fallen and as of now we’re back in negative territory. Based on its data, we apparently are entering the second leg of the double-dip recession the doom-and-gloom economists have warned us about. Clusterstock has another graph to show. 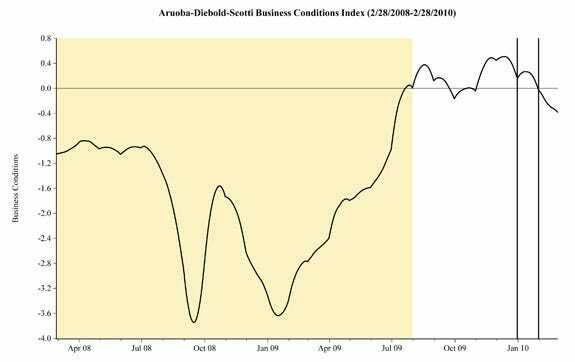 This one is the Aruoba-Diebold-Scotti business conditions index, put out by the Philadelphia Fed. And with it, you can see another example of a rollover and downturn. The Philly Fed index blends a bunch of different indicators both of high frequency and low, plus stock and flow data. It counts weekly initial jobless claims; monthly payroll employment, industrial production, personal income less transfer payments, manufacturing and trade sales; and quarterly real GDP to create its numbers. And while it didn’t show a rollover into negative territory until about a month ago, it shows the economy moving south at what looks like an increasing clip. If you look around, you’ll find graphs like this in a number of places. Perhaps we’re just seeing a seasonal belch and it’s no big deal. But perhaps we aren’t. And it’s fairly obvious that nothing coming out of either Washington or Wall Street is inspiring confidence that the economy is coming back. So when graphs like these start popping up on all the financial blogs and economic sites, it’s troubling. Very troubling. We’re not out of the woods.